Ah, my friends, if you care about women’s rights, if you love Jesus and read the Bible, you must place this book at the top of the stack on your bedside table. I wish I had done so ten years ago but, instead, it moved from shelf to shelf and went unread until this summer. Using transcripts from Anne Marbury Hutchinson’s trial, Eve LaPlante creates a riveting account of the attempts by the men of the community to entrap Hutchinson and of her intelligent answers, where she quotes scripture in her replies. In this book, LaPlante weaves in descriptions of Hutchinson’s earlier life in England, the events that led up to the trial, and her imprisonment and exile afterward. 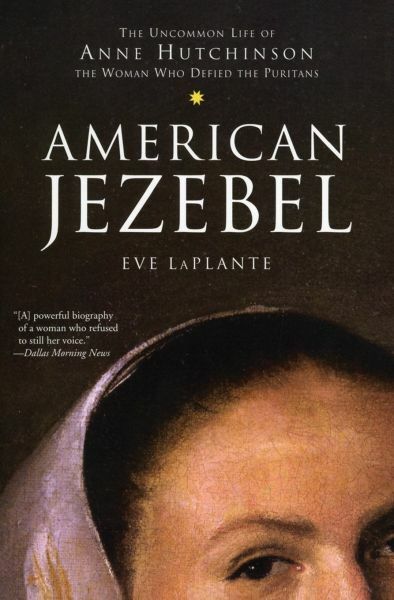 Not until page 128 did I write an expletive in the margin against the men who ruled the Massachusetts Bay Colony, but on page 218, when I read how they exploited the news of her failed sixteenth pregnancy, I shed tears of anger at the persecution and suffering of this courageous woman. I had postponed reading this book because I knew the outline of her story. A Puritan woman, she held Bible studies for women in her home, attracting even their husbands with her insightful exegesis, and was finally expelled from the colony for being a woman of power who did not agree with religious authorities on the finer points of doctrine. She and her followers founded a new colony that later became Rhode Island, and then when Massachusetts threatened to take over that colony, she fled to the Dutch colony (now New York), where she was killed by Indians. • She believed in salvation by grace, not by works, quoting Ephesians 2:8–9. • When her accusers quoted 1 Corinthians 14:34–35, 1 Timothy 2:12, and other verses against women teaching a mixed-gender congregation, she countered with the example of Priscilla instructing Apollos in Acts 18:26. • When Governor John Winthrop claimed these passages did not apply to Hutchinson’s teaching in 1637, she answered, “Must I show my name written therein?” (in scripture). • She challenged the court to name any law she had broken and to provide evidence for the main charge against her—that she was the cause of all political unrest in the colony. Reading this book, I felt very close to the heart and mind of a woman who lived four hundred years ago yet whose battles we still fight today. The ignorant, woman-hating men are still with us, ignoring God’s Word and simple standards of justice to reach their political goals and retain power. In much of Christendom, women are still not allowed to preach, nor have they ever held many of the highest offices in US government. “The problem of Anne Hutchinson is the problem of the public woman,” wrote literary critic Amy Schrager Lang. LaPlante quotes her and reflects on the possibility of Senator Hillary Rodham Clinton running for president, asking, “Could John Winthrop still be correct in observing that it is not proper or comely for a woman to hold power?” (p. 243). Gatherings of women—a dangerous thing! It was the meetings of women in 1848 in Seneca Falls and in the late 1960s throughout the US that strengthened the cultural advocacy that resulted in a societal movement toward women’s rights. Hutchinson at first avoided these meetings in Boston, but was criticized for not attending; when she did begin to share her reflections on the week’s sermon, it’s not surprising that her biblical training and high social status attracted many, including men. The villains of this story are John Winthrop and his allies, who wanted to retain their charter to be a colony (granted by King Charles I) by proving that they had a peaceful, well-governed society without any challenges to the social order. Their battle against the Hutchinsonians was called the “first great struggle for control” of Massachusetts by historian David Hall, according to LaPlante (p. 131). In reading this book, I developed an abiding hatred for this man as if he were alive today (which, in different incarnations, he is). The judges recorded at the same time their own biases and deviousness, declaring her guilty without any specific charges: “[Y]ou have stepped out of your place [as a woman] … You have rather been a husband than a wife; and a preacher than a hearer; and a magistrate than a subject” (p. 200). The most heart-breaking parts of the book are where LaPlante reveals the physical handicaps under which Hutchinson stood trial and endured banishment. At age 46, the mother of 12 living children and a few weeks pregnant for the sixteenth time, she was required to stand (literally) for two days in November 1637 in a cold meeting room without a fire as she answered questions. She and her husband had walked five miles through snow and ice in two hours to get to the trial in Cambridge; it was not held in Boston, where she lived, because she had too many supporters there. After being convicted, she was held in a house prison for six months, away from her children, including the younger ones ages 1, 4, 6, 7, 9, 10, and 13. During this time, she also faced a church trial, in which she was accused of not believing in the resurrection of the body, though she said she did (p. 182). On April 1, the first day of her banishment, with a foot of snow on the ground, she and her family began their six-day walk to Rhode Island. Earlier, they had condemned her friend Mary Dyer for her stillbirth of an anencephalic child; Hutchinson had served as midwife and discreetly buried the child without reporting its condition, so this act became one of her crimes. “For these men, the deformed birth, like that of Mary Dyer, demonstrated the obvious link between the intellectual woman and the Devil,” comments LaPlante. The two heroes of the biography are Hutchinson’s husband, Will, and her father, Francis Marbury, a Puritan who was tried for heresy in 1578, imprisoned three times, and banned from preaching. Lacking sons and believing, like Queen Elizabeth, that girls could learn, he trained his daughters in “reading, writing, arithmetic, and biblical exegesis in the original languages of scripture, Hebrew and Greek, as well as English” (p. 30). The books he used to teach them reading were the Bible, John Foxe’s Book of Martyrs, and a dramatic dialogue of his trial under the Bishop of London, which he published in the early 1590s. Anne Marbury Hutchinson thus learned from her father both her Bible-based faith and her readiness to challenge ignorant religious authorities. As an evangelical feminist, I found fascinating the details of the religious controversies in which she participated. Are believers “elect” from the beginning of time? Can we know whether we are one of the elect—or whether someone else is? Does sanctification (the outward appearance of grace) prove we are saved, or are outward appearances simply “works,” not evidence of a heart that is right with God? Hutchinson was a true evangelical, wanting to give others the inner experience with Jesus through the Holy Spirit that she had (p. 100). For twenty years, she worked closely with the Puritan pastor John Cotton, preparing souls that he would then “convert.” Because she also worked as a midwife, she had many opportunities to speak heart-to-heart with women. In addition to her learning, her faith, and her insistence on freedom of conscience, Hutchinson’s pacifism and her generous spirit toward the American Indians impress me. She opposed the Pequot War in the summer before her trial; her followers refused to participate, but the other colonists of Massachusetts and Connecticut massacred the entire Pequot tribe of eight hundred persons a few months before banishing her (p. 110). In Rhode Island, her colony had excellent relations with the Narragansett Indians, so it is sad that (after being widowed and after the threat from Massachusetts) she moved her family to the Dutch colony north of Manhattan, where the director-general Willem Kieft was cruel to the natives and massacred hundreds in the two years before her arrival. This book left me reflecting on Susan’s choices: life as a woman in colonial New England or life with the Siwanoys. Which would you choose?